Agaricus brunneofibrillosus is a beautiful winter species found under Monterey cyprus on the California coast. 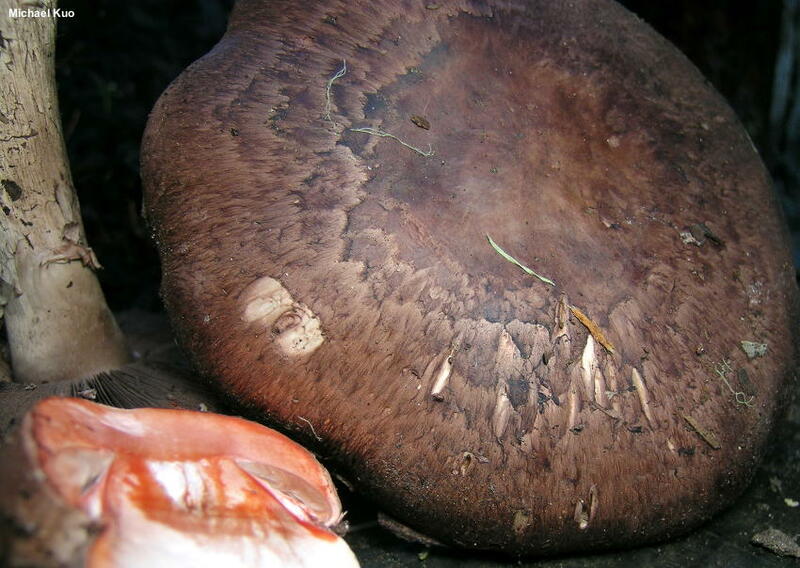 Crucial identifying features include the reddish brown cap with appressed fibrils, the red-staining flesh (slice a specimen in two to see the color change), and, often, the brown ringlets on the lower part of the stem. There are two similar red-staining species also found under Monterey cyprus: Agaricus pattersoniae, with a finely scaly (rather than appressed fibrillose) cap, stockier stature, and larger spores—and Agaricus benesi, with a whitish cap. 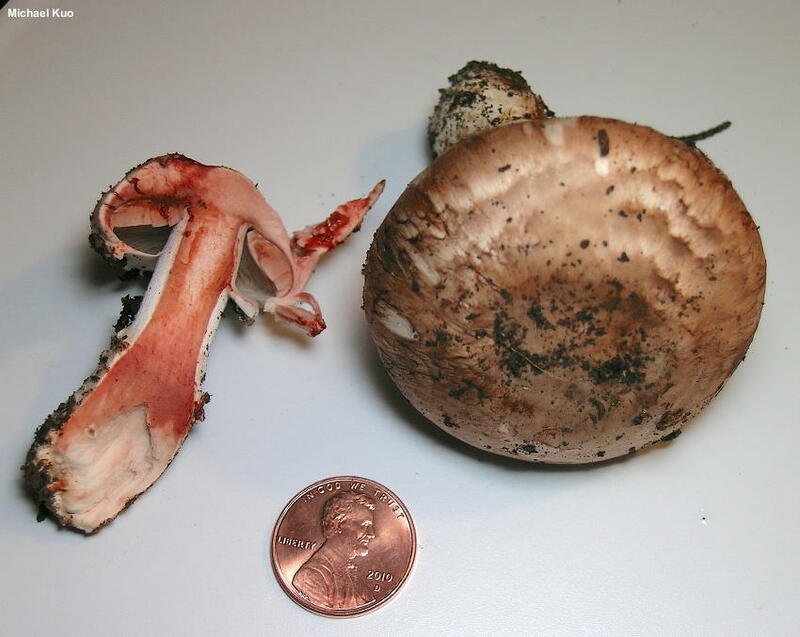 Agaricus brunneofibrillosus was known as "Agaricus fuscofibrillosus" for decades, but recent research by Kerrigan (2016) indicates the latter species is strictly European, and that the California species is distinct, closely related to the very similar Rocky Mountain species Agaricus amicosus. Ecology: Saprobic; growing scattered or gregariously under Monterey cyprus; winter; along the California coast in the range of the associated tree. The illustrated and described collections are from San Francisco and Marin counties. Cap: 3–8 cm; convex when young, becoming convex; dry; innately appressed-fibrillose; pale brown to reddish brown; the margin not changing color when rubbed. 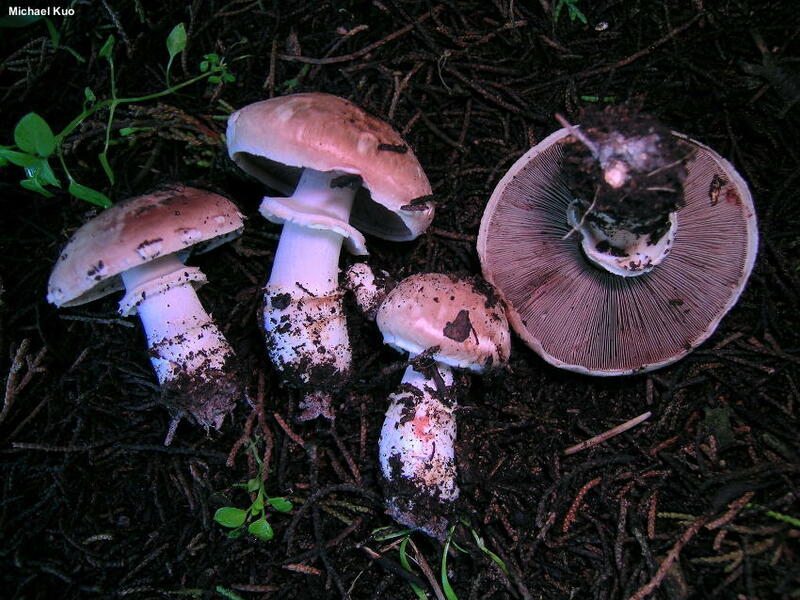 Gills: Free from the stem; crowded; whitish to pinkish when young, becoming dark brown with maturity; covered when in the button stage with a whitish partial veil. Stem: 3–8 cm long; 1–1.5 cm thick; slightly enlarged toward the base; whitish to brownish above, but sometimes colored like the cap near the base; bald, becoming fibrillose; bruising pink to red when fresh; with a skirtlike, whitish ring; usually featuring one to several brown to brownish ringlets near the base. Flesh: White; quickly pink, then red when sliced. 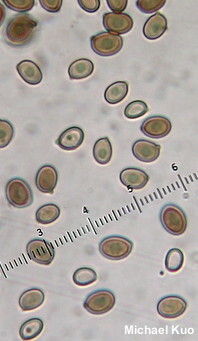 Microscopic Features: Spores: 5–6 (–7) x 3–4 µm; ellipsoid to broadly ellipsoid, with a tiny apiculus; smooth; thick-walled; yellowish to brown in KOH. Basidia 4-sterigmate. Cheilocystidia up to about 30 x 6 µm; mostly more or less cylindric and basidiole-like. Pleurocystidia not found. Pileipellis a cutis; elements 7.5–12.5 wide, brown in KOH. REFERENCES: Kerrigan, 2016. (Arora, 1986; Kerrigan, 1986; Desjardin, Wood & Stevens, 2015; Kerrigan, 2016; Siegel & Schwarz, 2016.) Herb. Kuo 01141104.